Mystic Fractals closes shop ! Free download of powerful fractal generators now! 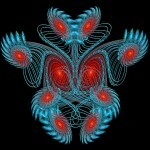 Welcome to Fractal Forums > Fractal Software > Fractal Programs > Announcements & News > Mystic Fractals closes shop ! Free download of powerful fractal generators now! Terry is offering the fruit of his labours as a free download ! These are super powerful fractal generators ! Re: Mystic Fractals closes shop ! Free download of powerful fractal generators now! Sad that he's closing shop, but great that he's giving away such cool software! Most of his programs export .obj files, and that is one of my favorite features for any fractal generator! I hope these do that to. Guess I'll find out shortly! I'll grab the 64 bit ones anyhow despite being on a dinosaur computer from 2002 right now.. Thanks for sharing it here, looks great! Thanks! I installed them, haven't done much with them yet but they seem very good. It is sad but I guess inevitable that he would retire after such a long and fruitful stint. I have used his free software since I started on Fractalforums, and appreciated his kind help . I told him I would buy a programme when I had the money and a new machine! But I guess I am too late! Just when I am finally getting a MacBook pro he shuts up shop! Anything I can do to promote his oft ware and contribution I will continue to do. The doth of his work is vast. I have not graduated beyond the simplest applications of his older Quasz app! I hope I will be able to do justice to the power of his generators as I develop my take on physical process models of fundamental physics and chemistry especially the magneto sono phono thermo electro photon model of materiality.